No one has more fun diving than a kid with mask and flippers. I wasn't little, but I was a kid having a lot of fun. Long ago, in a time of a rather wild youth, I made a dive. I never wrote about it, but I was reminded of it recently, so I guess it must be time to tell the story, no matter how unlikely (or not so bright) it seems, even to me. Just remember, I was probably 18 at the time and in fantastic physical shape, even if maybe a little sketchy. I could easily dive to 70 feet holding my breath and frequently did, so maybe this was possible. Heck, it was only about a 400 foot swim underwater. I'll tell the story the best I recall it (it was extremely memorable) and I did ask Kevin about it to see how he remembered his part. He still remembers that lobster, but even more than that, the currents. Well, it still seems a bit unbelievable, but then that's what it seems when I think now about bodysurfing the huge waves of Santa Cruz. Just keep in mind it was a capillary depth gauge and you can think what you want. It's true to the best of my knowledge. Did he go too deep or just hold his breath too long? Question: "So how deep have you gone"? You can see the Pinnacles offshore. Those are beautiful diving. Zuma Beach at the north end of Malibu is one of the most beautiful beaches in the world. It is clean white sand that goes on for about 5 miles or so. There are showers and lots of parking. It is where I learned to dive and I literally spent at least a thousand hours there, mostly free diving for clams out past the sand dollar beds. The water over the sand was clear, even when other parts of Malibu were too dirty to dive. Rocky reefs are wonderful, but the sand has a lot to offer too. Life there is just different. After the diving, you could have a great time bodysurfing. Waves there throw out instead of tipping though. On a big day, you can get brained. It taught me my wave craft well. It was easy for me to get to. It is an "endless beach" and I loved it there. One weekend, my buddy Kevin and I went to Westward Beach (before it had that name) at the south end of Zuma. It's large area by itself, but at the end of the beach is a small area past some rocks known as "Pirates Cove" and was pretty much clothing optional at the time. 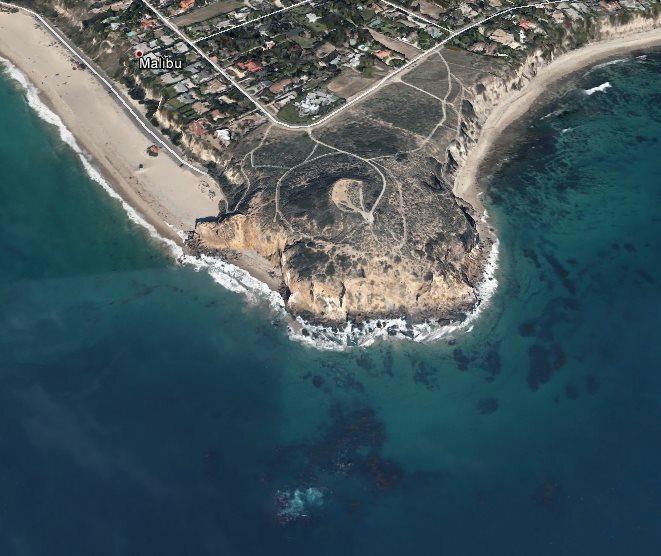 The cliff there where it starts is probably photographed more than anywhere on the Malibu shore. This is under Point Dume. It is where Iron Man's mansion is located in the recent movies. The attraction of diving there is not the Pirates Cove, but the cove around the corner on the backside of the Point. It is calm and rocky, with only light kelp growth and little game, but for a novice diver it was a large, beautiful and exciting playground. Also there are the offshore pinnacles which are excellent diving, but beyond my skill to reach at that point. 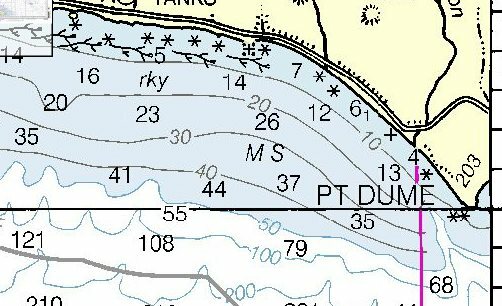 Curiously there is also a submarine canyon with a narrow finger that comes almost to shore there, called Dume Canyon. It is why you may see pelagics there including blue sharks and I even saw a couple pilot whales once. Enough said. It is a large, varied playground for a diver. 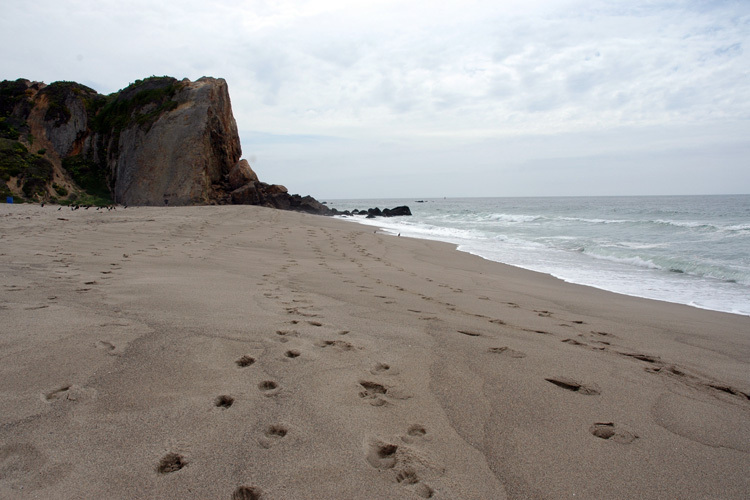 Point Dume is an amazing place. I learned the currents there well, but at the time did not really know about them in the detail I later learned. Normally the long shore current picks up speed moving south all along the length of Zuma Beach and whips around Point Dume. About one o'clock, it stops for about 45 minutes and then reverses and heads north. I had a number of good dives there based on planning around that slack period, but that was later on. Now I knew nothing of the currents there. This was a clear, sunny SoCal day with fair vis in the water over the sand. We were both far more enthusiastic than qualified as divers. The details were complicated, but it was small details that added together to make the result. Note that we both had steel 72's with J valves. That was then. This is a nice place for divers that don't mind a little hiking. We started north of the cove using a small surfboard as a float along with an innertube with a dive flag attached that stuck up about 4 feet on a fiberglass stick. Not only was a surfboard a bad float for diving, but we were in a whipping long shore current like you get there. It was pulling on the innertube real well. We fought the current for a probably 30 minutes and then headed back towards shore. It was nasty. There was also a strong Santana wind blowing offshore, a bit further out. We re-grouped and decided to take only the innertube with the dive flag on it. This time though, we were heading out straight into Pirates Cove. We were still fighting the current again and I told Kevin I was going to go down and see if there was any diving. It was just sand so I came up. We struggled on further for a while, that innertube just grabbed currents, and I said I would be right back. I went down right about where Iron Man's house would have landed after the bad guy blew it up, but again it was sand in about 30 feet of water (shallower than in the movie). This time though there was a huge lobster sitting in the open on the sand. I grabbed it, went up and held it up for Kevin to see. He says it is still the biggest lobster he has ever seen. Since I was holding it, he put it in a gunny sack he had that we usually used on fishing boats, instead of my canvas game bag. We were tired and frustrated by the currents. We swam for a while longer, but we were not winning. I told Kevin to give me the gear and head in. I took everything including the bags, innertube and a big old speargun of his father's. I even had a heavy steel abalone iron I had milled in shop class. I swam for a while... I assume I was moving backwards and the wind was blowing me offshore. I decided to shift the gear around to see if I could do better. I managed to drop the gunny sack with the lobster in it... I went straight down after it and put in my regulator in my mouth on the way. I immediately found it, next to this huge market crab. I grabbed both, looked at my gauge and headed for the surface. To the best of my knowledge, it said 180 feet. OK. I dunno. It was very deep and a very short dive. Whatever. Many movies and commercials have been filmed there. Now keep in mind, when a diver is over sand, they naturally swim towards a dark spot, because that is probably a reef in the gloom. This was especially true for me at this time. I got to the surface and was a long way from shore. Out there I was fighting the offshore wind more than the currents now. I again decided to re-arrange the gear, largely because I was afraid that huge crab was going to pinch me through the gunny sack or manage to get out. I was going to put it into the other canvas bag. I dropped it again, but this time when I grabbed for it, my fin came loose on my foot. I got it on, got my regulator in and went down fast. This time when I reached the sand, I didn't see anything. I swam fast, but I was sort of swooping down gullies down a slope. I had no knowledge of marine canyons, let alone this one, but I've learned since that they are steep with sort of a muddy sand. There was significant light loss at the depth and though I wasn't familiar with symptoms of narcosis, I did notice that I had tunnel vision. My habits meant that I was heading for the dark spot, which was down. I was moving fast, but I looked at my depth gauge and it said 220 feet. I just thought "stay here and you will die". I headed straight up again. At the surface, I was far from shore and saw no sign of my innertube or the gear attached to it. I started a long swim to shore. I eventually got out of the water near the rocks at the edge of the cove. Kevin was standing there. He said he had seen the dive flag heading over the horizon, so he was about to notify the lifegaurds when he saw me. This was on a single 72. I do not recall pulling the reserve. Did I make it to 220 feet? I'm not sure, but I did have enough time to get serious tunnel vision and it was very dark in clear water on a sunny day. Later experience shows that I don't get effected by nitrogen narcosis that much, at least to 165 feet. ... It was memorable. I expect that the lobster got out of the bag. I hope so. It might have eaten that crab. Both were huge specimens. Yah, it wasn't that bright, but it was very memorable. Answer: "Do you mean intentionally or accidently"?